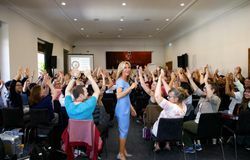 Our accelerated weekend hypnosis training course is excellent for anyone who wants to learn hypnotherapy with a maximum of "hands-on" experience. Over the course of our training you will be guided through the Basic Hypnotherapist training by one of our top instructors, using "hands-on" practice, lecture, and discussion. 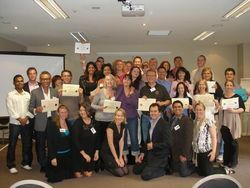 You will find that you can use hypnosis with clients after the successful completion of this course - which includes 3 Days of practical Hypnosis application. 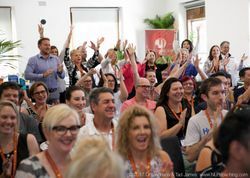 Once you attend this course, you can then move on to study our full Diploma Program, (recognised by the Australian Hypnotherapists Association - AHA) if you are looking for a Hypnotherapy Provider number for your business. If you are already a member of the AHA, then you will be pleased to know, it is also recognised as CPD points. Are you wanting to start something new in 2018? Then this is your first step towards starting a new career in a very rewarding industry. 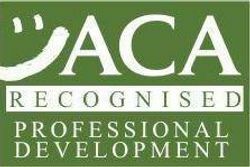 Due to the popularity of Hypnotherapy and demand for quality Hypnotherapists, there has never been a better time to become a practitioner now - do what we teach and you will be busy very quickly! Are you already a practitioner using other modalities? Then expand your practice, increase your client numbers and include Hypnotherapy as part of your skill set. The average Hypnosis session ranges from $150-$500 so you can have a positive return on your investment in a very short time. Hypnotherapy has been used in personal & professional development for many years. This is a hands-on training and we focus on Quit Smoking, Over Eating, Performance Enhancement, Stress Reduction and Bad Habits. You will have the opportunity to experience and receive the positive benefits of Hypnotherapy and you may be surprised just how good you feel by the end of the last day! If you have taken other trainings in Hypnosis, you will probably find this easier to learn than most, and the reason is that we lay it out logically and make it easy to learn by building on the successes you have over the course of the training. Start practicing from day one. 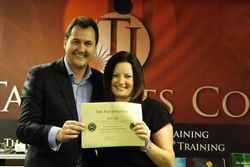 All of our trainers are Certified Hypnosis Trainers as well as certified Trainers of NLP and Time Line Therapy® and Coaching. In addition to this, the Tad James Company Training and Coaching staff all have personal experience in this industry and are experts on making it work for individuals. Over the past 32 years we have taught thousands of students to become Hypnotherapists. This training is designed to be simple to learn and easy to master. In the office, we have highly qualified personnel who are on hand daily to support you in getting the results you want. You can just call any time - there is no ongoing fees for support, it is all included in the service we provide. Upon successful completion of your training, you will have the option of applying for Certification through the ABH which is the second largest certifying body of Hypnotherapy in the world. In addition to this, we will give you the steps to take to receive insurance for your business should you start seeing clients.